Dragon bowls are one of our favorite meals because they’re so simple to make and work with any veggies you have in your fridge or pantry. This particular combination was a happy accident but feel free to swap and experiment on your own! The key is finding a starch base (brown rice, millet/quinoa noodles, quinoa, etc.) and building from there. In boiling water, cook ramen noodles for 3 minutes. Drain, cool with ice cubes or cold water, drain again and set aside. In shallow small bowl, add half cup of dried hijiki into 1 cup of warm water. Let soak for 10 minutes. After ten minutes, hijiki should be soft, drain and set aside. Heat shallow pan, add teaspoon of coconut oil and garlic. When garlic is fragrant, add beads. Saute until browned, about 3 minutes. Set aside. In same pan, heat another teaspoon of coconut oil and garlic. When garlic is fragrant, but not brown, add mustard greens. Saute until wilted and browned (add water if necessary.) Set aside. In same pan, heat another teaspoon of coconut oil. When sizzling, add zucchini disks. Season with salt and pepper. Lower heat and cover so zucchini steams. After 3 minutes, flip zucchini and cook other side. Zucchini should be done in 6-8 minutes. Remove from heat and set aside. To assemble bowl, choose deep soup or ramen bowl. Add noodles. 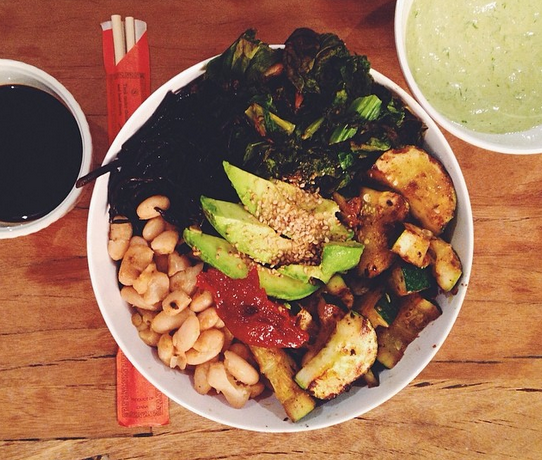 Arrange each vegetable along the perimeter of the bowl. Add sliced avocado in the middle. Garnish with sesame seeds, sea salt, black pepper and a dollop of Korean hot paste. Serve with tamari sauce on the side for dipping. Enjoy!